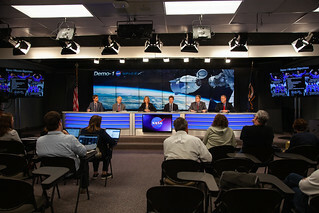 In Kennedy Space Center’s Press Site auditorium, agency and industry leaders speak to members of the media on Friday, Feb. 22, during the post-flight readiness review briefing for the SpaceX Demo-1 Commercial Crew Program (CCP) mission to the International Space Station. From left are: Josh Finch of NASA Communications; William Gerstenmaier, associate administrator, NASA Human Exploration and Operations; Kathy Lueders, manager, NASA Commercial Crew Program; Hans Koenigsmann, vice president, Build and Flight Reliability, SpaceX; Kirk Shireman, International Space Station Program manager; and Norm Knight, deputy director, NASA Johnson Space Center Flight Operations. The inaugural uncrewed flight of the SpaceX Crew Dragon, known as Demo-1, is targeted to lift off from Kennedy’s Launch Complex 39A on Saturday, March 2. EST. A SpaceX Falcon 9 rocket will launch the Crew Dragon on a mission designed to validate end-to-end systems and capabilities, leading to certification to fly crew.